Literally translated, this is the "Horn of the Devil". 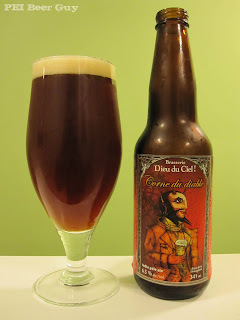 Something devilish in IPA form from a quality Quebec brewery? Sounds like a winner to me, and a great way to continue my IPA theme this week. The beer looks like a hazy, pale red or a dark amber ale... it's somewhere in between. The head has great retention. A finger plus of cream-coloured head lowers a bit and then stays at around a few millimeters. That's right, American readers - millimeters. There is lots of lacing on the way down. I could smell it as soon as I opened the cap; citrus - like grapefruit, some malty caramel scent put into the mix, a hint of evergreen... it reminds me of some of my favourite IPAs, and I can almost taste and feel that bitterness already. For some reason, I expected this to be on the lighter side of IPAs. Thankfully, it's better than I expected. Even though it was bottled a couple of months ago, it has retained its hop flavours very well. That hint of malty caramel is there from start to (mostly in the) finish. It plays well as a nice, smoothing balance to the hops' bitterness. It's quite subtle, and as such, is still dominated very much by the hops. This is a more-bitter-than-expected IPA, which I am happy to say. I love the way that fresh bitterness opens up my throat and gives that fresh, airy feeling. The fruit flavours come out as mandarin oranges and grapefruit. The mouthfeel, really, is great. It's bitter, but it should be. The finish is a little resinous and sticky, which I like in an IPA. This beer was "sneaky good". I thought, being a Dieu du Ciel! product, that it would at least be decent, but I didn't expect it to be as good of an IPA as it was - with a slight malty twist. I'd go back to this one again.